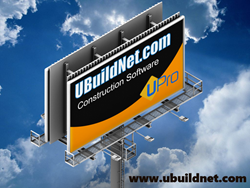 Construction Software – UBuildNet.com’s Cloud Based UPro Software is a No Cost Complementary Feature! When it comes to construction software http://www.ubuildnet.com the construction and home improvement industry leader in online solutions has changed the rules. The cloud based UPro Project Dashboard from UBuildNet.com is now totally complementary with all of the same great features and tools. UBuildNet.com today announced UPro Project Dashboard is now a completely free feature on the http://www.ubuildnet.com website. UBuildNet.com’s UPro Dashboard is intended to fill a void in the construction software arena. Construction software is often overly complex, too expensive, enterprise based, or designed without the user’s needs being addressed. UPro sits in the cloud, works on any device, and improves the users experience by simplifying processes. When it comes to software the construction and home improvement industry require a solution that’s just a bit different. Flexible, affordable, and easy to use; yet powerful enough to capture the complex components that make up today’s projects. UPro is construction software for handling projects, estimates, proposals, work orders, purchase orders, change orders, invoicing, and more. Seamlessly integrated with the communication, networking, and marketing features of UBuildNet.com, UPro lets construction professionals manage daily business operations from any Internet-connected PC, laptop, tablet, or smart phone whether they are in the office, on the road, with a customer, at a construction site, or home finishing up some business. UBuildNet.com is a niche site dedicated to the construction industry. Finding and cultivating solid relationships is a critical, demanding requirement for successful contracting. Although the Internet and social media bring new, advanced networking possibilities that significantly expand on older, traditional networking methods, social media did not emerge with an aim to optimize business or to meet the unique needs of builders. Only UBuildNet was conceived and built by construction professionals to meet the specific needs of the construction industry, its partners, and its customers.